This May, UVic’s second annual REACH Awards celebrated UVic artists, scholars and scientists for their extraordinary contributions in research, creative practice and teaching—whether from a field school in Cuba or a performance atop a glacier in BC’s interior. That’s where this year’s Award for Excellence in Artistic Expression comes in: the 2018 recipient is Visual Arts chair Paul Walde, whose Requiem for a Glacier performance and subsequent gallery installations have earned him international attention. While the history of Canadian art has been built on our relationship with landscape and the environment, Paul Walde has fused that artistic legacy with decidedly 21st century concerns and practices by exploring unexpected interconnections between landscape, identity and technology. 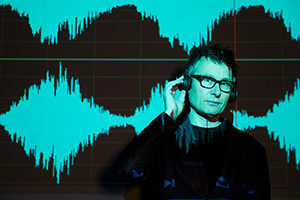 Since joining UVic in 2012, Walde has enhanced the student experience while expanding his reputation as one of Canada’s leading extended media artists. 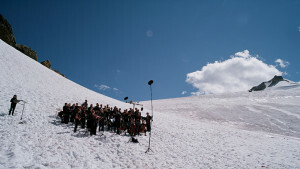 2014’s Requiem for a Glacier saw him take a 50-piece orchestra and chorus to the top of BC’s threatened Jumbo Glacier (Qat’Muk) and, while the performance earned international headlines at the time, the subsequent gallery installation continues to impact viewers across Canada and Europe—notably this spring’s exhibition in Paris. The awards were presented at a special on-campus evening ceremony on May 24. School of Music professor Suzanne Snizek was the 2017 winner of the REACH Award for Excellence in Artistic Expression.